As a fashionista I know the value of a label - even if I can't afford to purchase the article of clothing it's attached to. I have certain expectations when I see names like Yves Saint Laurent, Christian Dior, Donna Karan. I will forever associate the infamous Little Black Dress with Coco Chanel. I know that Alexander McQueen's aesthetic is going to be vastly different from Donnatella Versace's or Louis Vuitton's. Although it generally takes a while for the haute couture influences to make their way into the pret-a-porter world it is the shapes and colors that define the major labels that morph into what we everyday fashionistas lust after in the stores. Yet, when I label myself a spaz, a palsy, or a cripple the reactions I get are very negative - especially among my peers. "Don't say that!" They tell me. "You're differently-abled," or, "you're physically challenged," or, "you're handi-capable" - my personal favorite. While I truly don't wish or intend to be offensive or injurious to anyone else I refuse to dilute or diffuse the specifics of my disability by reducing it to a politically-correct, technically flaccid, feel-good phrase. I have not arrived at this position unthinkingly. I think it's safe to say that anyone whom society deems as different gets ridiculed as they are growing up by other kids for their differences. We can spend the next 20 minutes debating the cruelty that all children at one time or another display towards one another, how wrong it is, how they're bullies, etc. I'm not going to bother with that. Righteous indignation doesn't neutralize pejoratives. When I was in high school - a Catholic high school - I suffered no end of taunts and torments. To be perfectly fair, some of those were well-deserved, but the ones pertaining to my disability were beyond any actions on my part. There is no need to give an itemized list of the slights I had to endure but there is one incident that turned the tables and made me understand how to deal with verbal abuse. One of my classmates used to get infinite pleasure in calling me "Paul" every time she saw me. Of course, her friends found this hilarious and she thought I was too stupid to understand that she was making fun of me. After hearing this for the better part of six months one day I'd had enough. "I'm not Paul; I'm Palsy," I spat back at her. She froze. Her friends were mute. They all turned red and looked away. None of them bothered me again. Oh, so I just have to be open, honest, and proud of the Outer Spaz? Aha! No, I didn't arrive at the "aha" overnight; but I did arrive. Nowadays if I'm approached by a curious child - the kind that run right up to me and ask, "What's wrong with you?" - I tell them. The way I deliver the answer depends on the child's age, but in general I explain that I was born this way and can't walk so well by myself so I use a wheelchair or crutches to get around. I'll answer even the snottiest kid's questions in the hopes the kid learns early in life that taunting a handicapped person doesn't faze them. Most kids aren't sure what to do, but even the shyest child generally warms up with a smile and a wink. I've met many kind, gracious people that are simply terrified of doing or saying the wrong thing. This is one of the negative repercussions of too much political correctness. I can't tell you how many times I've been approached with an offer of help by someone petrified their assistance might be misconstrued as offensive. My "labels" let them know that I'm very secure with who I am and they don't have to walk on eggshells around me. However, just because I'm comfortable with my Outer Spaz I never assume others are at ease with theirs. If I see other handicapped people when I'm out and about I do my best to make eye contact with them and smile - because I get it. Our journey is not an easy one but our path is not made easier by the averted eyes and nervous whispers that are not much better than stares and name-calling. 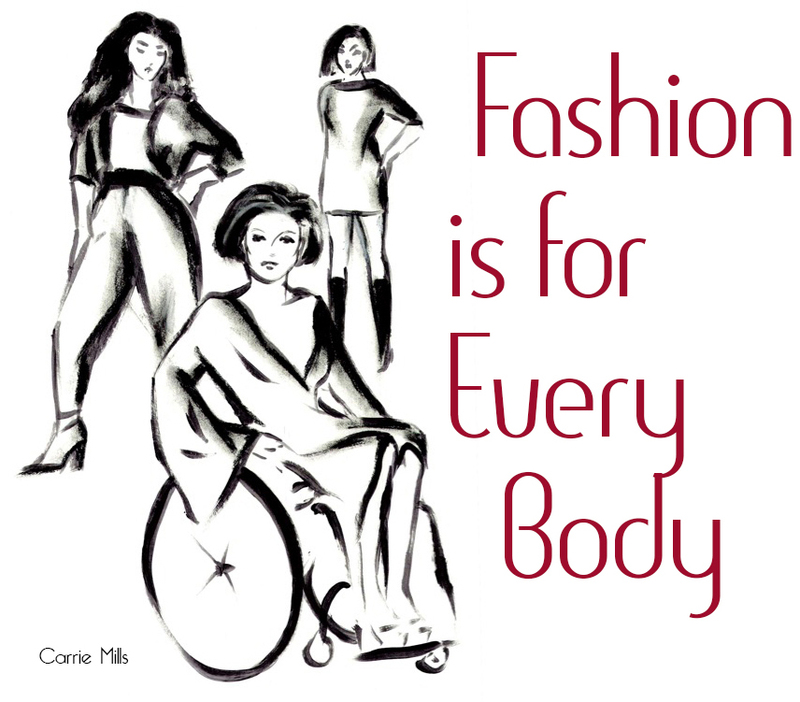 My attitude, along with my wardrobe, makes my disability much less important, much less prominent, in the eyes of others. After all, everyone has something they find physically challenging, and we're all differently-abled. I have Cerebral Palsy, and I wear it well.